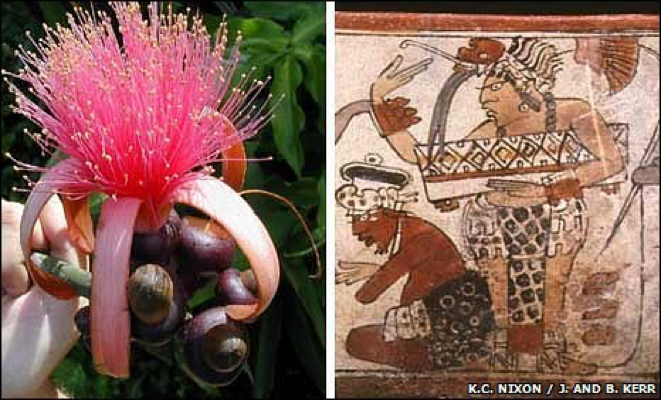 Flowers from the pseudobombax tree are pictured as part of a Mayan headdress. Photos by K.C. 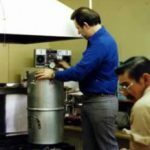 Nixon/Justin and Barbara Kerr. The unique flower of the pseudobombax tree (Pseudobombax ellipticum) was the inspiration for a headdress worn by Mayan nobles as depicted in Mayan art. The unique flower of the pseudobombax tree was written in the Mayan codices as k’uy-nik. Paintings of flowers in a Tikal burial were believed to make the resting place of the king fragrant and paradisiacal. This tree is also known as the shaving brush tree and the amapolla tree and can reach 60 feet in height. The descendants of the Mayan today use the beautiful flowers to decorate their homes and churches. According to one historian, the Mayans also concocted a highly intoxicating drink from this tree.